As many of you all know—I desire to be married. Really, I do. In a very earnest and sincere way. But I’ve recently challenged myself to compare my life today as Eve Un-Yoked to how it would be if I had “the infamous ring” resting on my left hand. What happens if/when I get married? How does my life change? What would I do differently? What would I see and understand differently? It’s amazing how your mind will take you places that are so far from your reality. I spent 24 hours wearing a strategically placed ring. It wasn’t real, it wasn’t given to me by the love of my life—I put it there for goodness sake! But all day my mind was creating experiences. Creating lives for those persons that the ring represented. It made me mindful of what the weight of that ring really means. The burden of that responsibility. It made me cognizant of the fact that my life is very compulsive. Its selfish in a way. Today my decisions change frequently to suit my own fancy, but that wouldn’t be the case if I were responsible for a healthy marriage. My choices would have to be different, my lifestyle would be different if I was responsible for raising healthy, well-rounded children. I’d owe my family self-less-ness. Isn’t that was REAL love is all about? Putting the well-being of others before one’s self? Does that selflessness come natural once you get married? Would I have to practice and learn that type of Love? Throughout the challenge I noticed that I worried more about my children than my husband. My mind stayed on the well-being of my kids, rather than the man who was helping me to raise them. Reality is, I do desire to be a mother and have children far more than I desire to be a wife. But is that fair? I know I’d never want to be out of order. I wouldn’t want to put the cart before the horse perse’–I’d want the classic nursery rhyme fairtale progression. You know, the: “first comes love, then comes marriage, then comes rugrats in the baby carriage” .. but if i’m already thinking about my children so much, putting their concerns before my mate’s, what does that say about the kind of wife I’d be? Is that why marriages struggle so much? Do spousal relationships just get neglected after the children come along? Do wives/husbands assume that their partner is “fine” and its only the children who have needs that they’re responsible for meeting? I didn’t even consider how much work a marital partnership requires. The extension of oneself. The pressure that comes with the job. You have to show up in a marriage. You owe that to your spouse. You have to BE THERE. To actively participate in the union. Am I willing to give that accountability?—To ensure that I’m holding up my end in finances, lifestyle and living responsibilities, even what I’ll help him carry in emotional worries and pressures? Taking his name means taking on his goals. His dreams. What I do represents him as a man. Him as a husband. Can I handle that kind of pressure? To always be mindful of the expected spousal representation. And though it seems minute– what about what I wear… ?? Do I want to ensure that when I walk out of the house everyday I’m representing my husband and my children appropriately? Today, the only person in the mirror I care about is ME. With a family, I’ll have to become the personal stylist of every little person in my household. From dresses and stockings to slacks and ties–all of it will matter somehow. I’ll have to do hair too (if I have daughters). I’ll have to cook, go to football games, PTA meetings, and dance recitals. I’ll have to attend or host corporate dinner parties and ensure my 5-cheese macaroni is perfect for his company potluck! I’ll have to make Bible Study, continue to pay tithes, property taxes and finance birthday parties, first-time-used cars, new glasses, and braces if required. I’d take days off for field trips, common colds, unknown rashes, and even spend 2 days with the hubby when he tears that ligament in his knee after I specifically told him he had no business trying to play basketball with our son’s friends. Yeah, its a lot. Its tiring I’m sure. But I’ll do it. Every last thing. Its the responsibilities that come with the job. Marriage and parenthood sounds amazing, It really does. The goodness of it, the purpose behind it; a God-structured family sounds perfect. But as I got out of bed the following morning and turned on the shower, I was glad to be able to move the ring back to my index finger where it rightfully belongs. I was relieved in major way. You see, I like my life. The ease of it. The simple pleasure from making decisions that affect just me and me alone. Still, I pray for “it” all the time—This Family / My Desired “Future”/ My Grown-up, REAL- WOMAN-LIFE. 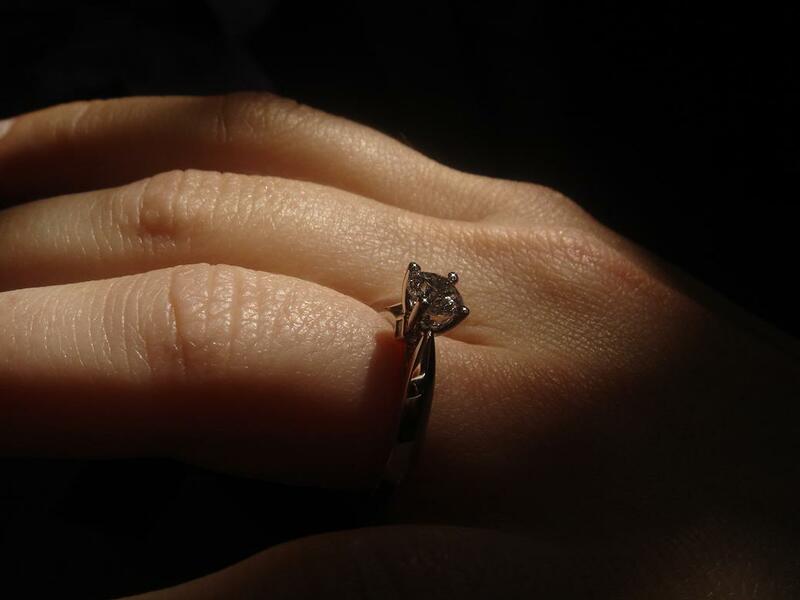 In my mind I thought I was ready, but after a 24-hour 4th-finger illusion I realize that no matter how STRONG and ABLE I think I am, there’s an even bigger burden that comes with the weight of the Ring so many of us singles desire. It’s sad, but to be perfectly honest, I’m just not ready for it.